Dan Molnar is great to work with, organized, professional, communicative and personable. He and his crew worked hard and did what was stated in the contract. We are very pleased with the results. Dan offered suggestions that enhanced the plans we had provided him. The work was not started on schedule, partly due to weather, but the quality of the finished product was worth the wait. Dan Molnar and his crew were terrific! His bid was in the middle of those received and when unexpected problems occurred during the project, he went out of his way to solve them at a reasonable cost. The quality of the work was excellent and his employees were friendly and professional throughout. I would not hesitate to hire him again. Met Dan Molnar through Angie’s List as I was beginning to look at the possible purchase of a lake house about 2 hours away from where I live. The lake house had been empty for at least 5 years and in need of repairs. I asked Dan to walk with me through the house telling me what could be saved and what needed to repaired/replaced. I was impressed that he spent time with me doing this before I decided to buy or even hire him. 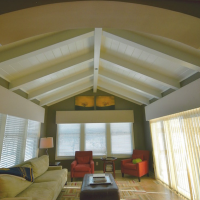 Molnar Construction completed a very extensive project that we envisioned in December 2013. 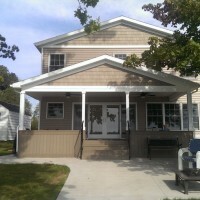 Coming from musical families, we had hoped to add a music room addition, off the back of our home and living room, in place of our then existing deck. However, we live in an area where the water table is relatively high, so we weren’t even sure such a project was possible. In addition to that, we wanted the new room well insulated, and also add a new deck with steps to a new concrete patio underneath. This meant building the room on stilts. We also wanted to re-purpose our huge picture window into the new room, not only to save cost but also to capture our beautiful view of woods and pond. Dan (the owner) was great to deal with. He was responsive through the entire process and his work product was top notch. He showed up when he said he would and the finished driveway looks great. Totally professional and a pleasure to deal with. Dan has completed several projects for us over the last 3 years. 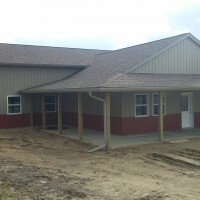 We have been very happy with all of the work and the people that work with Molnar Construction. We continue to use him for any projects as we know we can trust his work, level of expertise and timeliness. We have referred several others to Molnar Construction as well, and are so lucky to have found him to help with all of our projects. He is very hands on and makes sure expectations are met with quality level and customer service. We will continue to use Molnar Construction for all future updates! 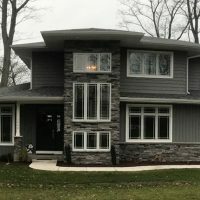 Dan from Molnar Construction’s price was reasonable and the house was built in the 1940s so he was reasonable about upcharges in terms of finding rotten floor joists or whatever that had to be replaced that weren’t part of the original quote. He’s a good listener and was able to come up with ideas. He was the one contractor that provided feedback and suggestions. If he didn’t agree with something I wanted he would tell me why whether it be from a cost or a structural issue so he was excellent at doing that. 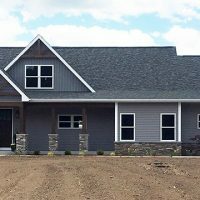 Dan from Molnar Construction was very responsive, always kept us up to date where the project was going, and didn’t do anything without consulting us. His crew were very professional, very friendly, and they did an excellent job. We are very happy. I did buy and had Molnar Construction do the work. As it ended up the entire house had to be gutted down to the studs. Mold behind walls, inefficient windows and doors, lack of insulation, falling drywall, inadequate electric service-everything needed replacing and updating since the house had been built in the 1950’s. |Dan let me work along with his crew doing as much as I could and I felt a part of the project. He offered suggestions and recommendations as to how to keep costs down and still have a quality house. He allowed me to do the priming and painting and finish the staircase as the budget was dwindling. Dan was upfront and told me that he is not the least expensive contractor but if you want quality work with no second guesses, Molnar Construction is well worth it. What we ended up with is a fantastic lake house. Everything inside is new-electric, plumbing, insulation, walls, flooring. Friends who have nearby homes are envious we have such a quality lake house. The project took about 6 months to be habitable. 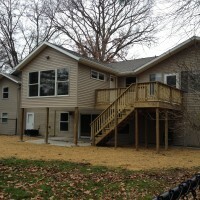 There is still more that needs to be done – deck, outside stairs and retaining walls, garage floor, and Molnar Construction will be my go to company to complete these projects as my budget allows. Dan does quality work and expects his vendors and sub contractors to do the same. Dan and I kept in touch through phone calls and emails. He ALWAYS answered phone calls and responded to emails. This was very important to me to have this kind of regular communication. I would not hesitate to recommend him for any construction needs. I have found a great contractor and hopefully a new Michigan friend. We figured the demolition alone for such a project could be challenging, because our home is in close proximity to a nature preserve. Because of that, care needed to be taken for ecological reasons, as well. After interviewing several contractors…we realized not everyone shared our vision. Dan and his crew were amazing!!! The care, positive attitudes, and professionalism they all brought to work each day were high caliber. Every evening, the job site was cleaned up to perfection! We were especially impressed when one of Dan’s employees used a metal detector to remove nails in the grass, after the roofing work was completed. With two dogs, that was an important detail for us. The concrete work on the patio surpassed our expectations – LOVE all the curves! And re-grading/seeding the yard will be appreciated again next spring. Our project took approximately 8 weeks to complete and was the most enjoyable project we’ve ever undertaken. Molnar Construction has literally made our dreams come true! Easy to work with, their hard work and dedication-to-detail will impact our lives for many years to come. of the industry, as well as your many construction talents. We appreciate that you choose like-minded individuals to make up your team. A big shout out of thanks to Eric – we like to think of you as co-pilot to Dan. You are one talented carpenter! Thank you for helping make our home so beautiful. Thank you also to Brandon, of Gilroy Painting. You and Nate did an amazing job in the music room, and completing the walls in the main house (the French doors are beautiful, beyond words). And the use of the eco-friendly filter when sanding was greatly appreciated. Thanks to Don who did the drywall, and also using eco-friendly products. Thanks to Tom, and his crew, who put in the carpet. Job well-done and appreciated each day as we enjoy the cushy feeling underfoot. Once again, thanks, Dan, to you and your crew. We look forward to working on future projects with you all again.